Home » Forums » Game Design » Game Design Showdown » [GDS] NOVEMBER 2015 "Heirloom quality"
[GDS] NOVEMBER 2015 "Heirloom quality"
Not many entries this month, but a record number of comparative votes. An intriguing challenge with some very nice components made this one extra tough. Judging by the voting response, there is quite a lot to talk about concerning both the challenge and the entries. Let's get to it! A low number of entries, which gives you more time to digest them. Which of these do you think fits the bill of an "heirloom" game? Voting: Through the 18th. Votes will be through a form linked here. You know those games with "heirloom quality" pieces? Chess, Carrom, Crokinole. These games often have finely crafted game boards that owners might prominently display in their lounge, and play whilst sipping sherry and ruminating on Descartes. What about a more "designer" game that would appeal to the sherry-sippers with teak furniture? Quality wood, carved with symbols, and embedded with Swarovski crystals. Your challenge this month is to create a pitch for a game that uses these heirloom quality tiles as the main focus. Regardless of other componenents, they should be of similar quality and the game should feel like a game that one would display in their lounge. My suggestions are to use an abstracted medieval theme like many chess sets, or similarly 'cultured' themes. But that's only a suggestion. Theme: Something timeless, 'cultured' feeling but no concrete restriction. Component restriction: Uses the fancy wooden tiles with coloured gems embedded in them. The object of the game is to score points by spotting the non-matching tile. 25 pairs of tiles. Each pair is unique in terms of its arrangement of colored gems and the central symbol. Scoring tokens and penalty tokens. The starting player takes the tiles from the bag, puts them behind the shield and finds 5 pairs and one non matching tile. These are mixed and the velvet cover is put over the token. Then the cover and shield are removed. The first player to spot the unique tile gets a point. If a player picks the wrong tile, they receive a penalty token and may not guess again for that turn. Once a player has spotted the unique tile (or if no player has done so within 3 minutes) all the tiles are placed back in the bag and they are passed to the player to the left of the starting player who then repeats what the starting player has done. Once the bag goes back to the original starring player, that player adds 2 more matching tiles to the set up and play proceeds as before. On this round the player who spots the tile gets 2 points. Each subsequent round, the number of tiles goes up by 2 and the point value for spotting the unique tile goes up by one. A player who accumulates 3 penalty tokens is out of the game, but they get to keep their score. If the choosing player takes more than 4 minutes to set up, they get a penalty token. When events transpire in a person's life, it is often unclear what the future holds. However, looking back, great achievements happen when the dots come together, and everything happens as it should. Tiles of fortune is a "fortune-telling game" for 1 or more people. Through the laying of tiles, players construct a narrative of a person's life, and through this, see parallels with reality, and help divine paths in your own life. 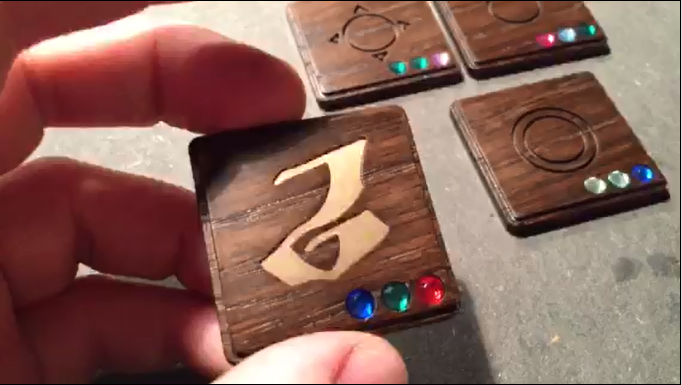 Players play tiles from the table, either from five face up tiles, or any not yet revealed tile. The new tile must be played next to a tile with a 'free gem' of a color the tile has. The remainder gems become 'free gems' The player should then narrate the event, based on the gems and the rune. Use tokens to keep track of free gems. At the start of the game, players should decide on a background and name for the protagonist. For example, there is a friend tile with a free blue gem. I place a blue/yellow journey tile next to the friend tile, remove the blue token, then place a yellow token on the new tile. The even would be perhaps King Arthur, on the advice of Merlin, goes on a journey to acquire the holy grail. If instead there were a free yellow gem, the same tile would produce a free blue gem, and the story might be Young Arthur is funded by Sir Kay to receive knightly training. The game ends when no tile can be played. White gems are wildcards, and can be matched with any color. 1 gem tiles are disasters. 2 gem tiles are used to move free gems. Yellow is most common, but is never matched with white. Using up two free gems with one tile is a 'fateful event', and you may place one white free gem anywhere on the board. A new tile can only draw 1 free gem from each adjacent tile. 3 gem tiles can increase the number of free gems. If a 3 gem tile uses 3 free gems, this is a 'monumental event', and the highlight of the protagonist's life, where everything comes together just right.You may play any tile without using free gems. Each player has a face up 'hand' of tiles, players may play from this hand, or draw and play a facedown tile from the table. When a player is unable to play a tile, they lose and shuffle their hand back into the poo. If all tiles are used, whoever plays the most monumental events wins, with ties broken by fateful events. Shuffle all 100 tiles. Create a 5x5 grid on the table with tiles face down. Place the 3 pawns on 3 different tiles. Deal 4 tiles to all players. Players will chose 1 tile and place it face down in front of them, the rest remain in hand. The face down tile is the score tile and will determine points at the end of the game. Place the rest of the tiles in a draw pile. During a turn, a player will be able to move any 1 of the 3 pawns and take an action associated with that pawn. Pawns must only move to an adjacent tile and cannot be on the same tile as another pawn. Ivory Pawn – cannot affect tiles populated with a pawn. 1 – Look at any face down tile. 2 – Draw a tile from the draw pile. Discard a tile from your hand. Ebony Pawn – cannot affect tiles populated with a pawn. 1 – Flip any face down tile face up. 2 – Replace any face down tile with a tile from your hand face up. 1 – destroy the face up tile this pawn is on. Replace it with a tile face down from the draw pile. The game is over when all tiles are face up or the draw deck is depleted. Players reveal their face down score tile. Any player whose symbol on their score tile matches the majority of symbols in the grid receives 10 points. A player receives 1 point for all gems in the grid that match gems in a player’s score tile. A two player strategy game of move and countermove, with a twist of deduction. Each player receives 19 tiles. 1 chief tile, plus 3 each of six different symbols. The chief tile has one crystal each of red, green, and blue. The other tiles have only one coloured crystal. The chief tile has arrows pointing in all eight directions. Of the 18 symbol tiles, nine have arrows pointing orthogonally and nine have arrows pointing diagonally. The symbols themselves could be basically anything, so as to leave room for distinctiveness in the craftsmanship between different game sets. The game board is a non-rectangular grid with nine rows. It is ten tiles wide in the center row with two rows of eight, two rows of six, and one row of four on each side. Each space has crystals in it. The spaces around the outside and the four in the middle of the center row have all three colours, the remainder have only two colours. The rows of four are covered and the four spaces in the middle need to be distinctively marked (providing more room for craftsmanship). To start the game each player selects four tiles and discretely places them in their covered spaces. Next the players select five tiles to use as starting pieces. These tiles plus the chief tile are placed in the first row of six spaces, in any order. The edge of the tile with the crystals indicates who controls it, so they need to be placed accordingly. Players alternate moving one piece at a time. A tile can be moved in the direction of any of its arrows to any open space in that direction where there is a like coloured crystal. No jumping over pieces. Opponent tiles can be removed from the board by moving a tile to an occupied space, but the crystal on your tile must be a different colour than on the opponent tile. You can take control of an opponent's tile by putting it in a position where it has no moves. You can gain new tiles by moving a tile to either of the spaces at the end of the row of ten. The new tile is placed in any open space in your first row of six. The goal of the game is to either figure out your opponent's hidden tiles or control all of the tiles in play. If you move a tile to the space in front of one of your opponent's hidden tiles and the symbol matches, your opponent must reveal it. The four spaces in middle of the center row are deduction spaces. If you move a tile to a deduction space and there are tiles in all four deduction spaces (regardless of who controls the tiles), your opponent must state how many symbols match their hidden tiles. If the tiles in the deduction spaces match your opponent's hidden tiles exactly, you win.